1. What is disability discrimination, or disability harassment? 2. What are some examples of disability discrimination? 3. Which federal law(s) cover people with disabilities? 4. Who is considered disabled under the law? 5. How will the disability definition be interpreted under the law? 6. Which employers are covered by the law? 7. Can I be asked about my disability in a job interview? 8. Can I be forced to take a physical or medical exam? 13. What if my employer thinks the accommodation would be too expensive? 14. When is my employer required to give me an accommodation? 15. What if I need an accommodation to apply for a job? 16. Is my employer required to modify the job facilities for me? 17. Can I be charged or paid a lower salary to cover the cost of the accommodation? 18. What if I’m not disabled, but am treated like I have a disability? 19. What if I’m not disabled myself, but care for or live with a person with a disability? 20. What if my employer does not know I am disabled? Am I protected? 21. Can I be prevented from working a certain job for health and safety reasons? 22. Can my employer refuse to pay medical insurance coverage for my disability? 23. Are substance abuse and alcoholism considered disabilities? 24. Can my employer ask me about my disability to determine my needs during an emergency evacuation of the workplace? 25. Does my employer have to favor the applications of persons with disabilities? 26. Can an employer establish specific attendance and leave policies? 27. What are my rights after becoming disabled on the job? 28. How does the ADA affect workers’ compensation programs? 29. Who enforces the law? 30. What are the remedies available to me? 31. How can I file a complaint? Disability discrimination can occur in many ways. It can be direct, and obvious, or indirect, and not so obvious. Below are examples of both direct and indirect discrimination. Direct: A restaurant allows a family with a child who has cerebral palsy to eat in their outdoor seating area but not in their family room. The family with the disabled child is not given the same choices that other families have. Indirect: A local authority, such as a Health Department, produces an information leaflet about its services for residents. In order to save money it does not produce an easy-to-read version of the leaflet. This would make it more difficult for someone with a learning disability to access the information and services which could amount to indirect discrimination. The ADA makes it illegal for private employers, state and local governments, employment agencies, and labor unions from discriminating against qualified individuals with disabilities in job application procedures, hiring, firing, advancement, compensation, job training, and other terms, conditions and privileges of employment. Sections of the ADA not relating to employment address discrimination by governmental agencies and in public accommodations. For more detailed information about the ADA, visit the U.S. Equal Employment Opportunity Commission’s website on Disability Discrimination. These are the primary federal laws that apply to workplace discrimination, although there are many other federal laws that make it illegal to discriminate on the basis of disability, for example: the Air Carrier Access Act of 1986 prevents discrimination in provision of air transportation, the Architectural Barriers Act of 1968 requires that buildings and facilities, designed, constructed, altered, or leased with certain federal funds after September 1969 must be accessible to and useable by handicapped persons, the Fair Housing Act prohibits discrimination in the sale, rental, and financing of housing based on disability, along with other minorities, and the Individuals with Disabilities Education Act ensures that students with disabilities are protected, and that all children with disabilities have available to them free appropriate public education. The laws of most states also make it illegal to discriminate on the basis of disability, and some state laws have different standards than the ADA for determining who state disability discrimination law covers. While the discussion below will focus on the ADA Amendments Act, you should check the law in your state and/or consult with a local attorney to see whether your state law provides additional protection. Most activities previously recognized under the law, such as walking and seeing, as well as new ones, such a reading, bending and communicating. In determining whether one has a disability, mitigating measures (if you are able to use medication to eliminate the limitations of your medical condition, or successfully use a prosthetic, hearing aid, glasses, or other assistive device) other than “ordinary eyeglasses or contact lenses” will not be considered. Even though an impairment may be intermittent or in remission, it will be classified as a disability if, when active, it would substantially limit a major life activity. If you are subjected to an action prohibited by the ADA (such as failure to hire) because of an impairment, which is either real or perceived, you will meet the “regarded as” definition of disability, unless the impairment is minor, and in transition. Individuals covered only under the “regarded as” prong are not entitled to reasonable accommodation under The Act. (For more information on this, see question 11). The ADA applies to all employers, including state and local government employers, with 15 or more employees. Many states also have laws that make it illegal to discriminate on the basis of disability. For more information, please see our page on the minimum number of employees needed to file a claim under your state law. Click here for more information on Coverage from the EEOC. If you are applying for a job, an employer cannot ask you if you are disabled or ask about the nature or severity of your disability. However, an employer can ask if you can perform the duties of the job with or without reasonable accommodation; an example of this is: this job requires you to stand outside for long hours, or, must be able to lift 20 pounds. An employer can also ask you to describe or to demonstrate how, with or without reasonable accommodation; you will perform the duties of the job. Federal contractors and subcontractors who are covered by the affirmative action requirements of the Rehabilitation Act may invite individuals with disabilities to identify themselves on a job application form or in some other pre-employment inquiry. Employers requesting this information must follow certain legal requirements regarding the way this information is requested and used. The information must be maintained confidentially and separately from regular personnel records. A pre-employment inquiry about a disability is also allowed if required by another Federal law or regulation such as those that cover disabled veterans and veterans of the Vietnam era. Pre-employment inquiries about disabilities may be necessary under such laws to identify applicants or clients with disabilities in order to provide them with required special services. You cannot be required by an employer to take a medical examination before you are offered a job. Following a job offer, however, an employer can condition the job offer on your passing a required medical examination, but only if all entering employees for that job category have to take the examination and the exam is job-related and consistent with the employer’s business needs. (You cannot be singled out for an exam merely because you have, or your employer believes you have, a disability.) However, an employer cannot reject you because of information about your disability revealed by the medical examination, unless the reasons for rejection are job-related and necessary for the conduct of the employer’s business. The employer cannot refuse to hire you because of your disability if you can perform the essential functions of the job with an accommodation. Once you have been hired and started work, your employer cannot require that you take a medical examination or ask questions about your disability unless they are related to your job and necessary for the conduct of your employer’s business. However, your employer may conduct voluntary medical examinations that are part of an employee health program and may provide medical information required by State workers’ compensation laws to the agencies that administer such laws. The results of all medical examinations must be kept confidential and maintained in separate medical files. You must satisfy the employer’s requirements for the job, such as education, employment experience, skills or licenses. You also must be able to perform the essential functions of the job with or without reasonable accommodation. “Essential functions” are the fundamental job duties that you must be able to perform on your own or with the help of a reasonable accommodation. An employer can refuse to hire you if you cannot perform these duties on your own or with the help of a reasonable accommodation. An employer cannot refuse to hire you, however, because your disability prevents you from performing duties that are not essential to the job. An employer is not required to reallocate essential functions of a job as a reasonable accommodation. For example: a grocery store bagger develops a disability that makes her unable to lift any item weighing more than five pounds. Since a bagger’s main job duty is placing items into bags and handing filled bags to customers or placing them in grocery carts, the store does not have to remove its fifteen-pound lifting requirement as an accommodation, since being able to lift bags of groceries is an essential function of a bagger’s job. An individual meets the requirement of being regarded as having such an impairment if the individual establishes that he or she has been subjected to an action prohibited under this Act because of an actual or perceived physical or mental impairment whether or not the impairment limits or is perceived to limit a major life activity. Major life activities generally consist of but are not limited to: caring for oneself, seeing, hearing, eating, sleeping, walking, standing, lifting, bending, speaking, breathing, learning, reading, concentrating, thinking, communicating, and working. Under the ADAAA, “major life activities” was expanded to include “major bodily functions”. This list includes, but is not limited to: functions of the immune system, normal cell growth, digestive, bowel, bladder, neurological, brain, respiratory, circulatory, and reproductive functions. If you are able to perform all of the essential functions of a job, except for those your disability prevents you from performing, the ADA and many state disability laws require that your employer provide you with a “reasonable accommodation,” which is an adjustment or modification provided by an employer to allow you to enjoy equal employment opportunities as individuals without disabilities. Making existing facilities used by employees readily accessible to, and usable by, persons with disabilities. Acquiring or modifying equipment or devices, adjusting modifying examinations, training materials, or policies and providing qualified readers or interpreters. A blind employee may need brail reading material. An employer is not required to violate a seniority system that is a product of a collective bargaining agreement to accommodate a disabled employee. Nor is an employer required to lower quality or production standards to make an accommodation, or excuse violations of conduct rules necessary for the operation of an employer’s business. Nor is an employer obligated to provide personal use items such as glasses, hearing aids, or prostheses. any accommodation costs already incurred in the workplace. It is not easy for employers to prove that an accommodation is an undue hardship, as financial difficulty alone is not usually sufficient. Other sources of money for making accommodations may be available, including tax credits or deductions and vocational rehabilitation funds. The disabled employee’s willingness to pay for all or part of the costs also can be considered, although the disabled employee cannot be required to pay the costs of accommodation. A request can be a statement in plain English; that you need an adjustment or change in the application process or at work for a reason related to a medical condition. The request does not have to include the terms “ADA” or “reasonable accommodation.” Also, the request does not have to be in writing, although your employer is then allowed to ask for something in writing to document the request. A family member, friend, health professional, rehabilitation counselor, labor union, or other representative also may request a reasonable accommodation on your behalf. For example, a doctor’s note indicating that an employee can work “with restrictions” is a request for a reasonable accommodation. Once you have requested a reasonable accommodation, you and your employer should discuss your needs and identify the appropriate reasonable accommodation. The EEOC has clarified that an employer refusing accommodation because the request does not fall within the company’s policy, will not be a viable defense. The ADA refers to this as the “interactive process,” a formal way of saying that you and your employer should talk about the request for a reasonable accommodation, especially where your need for the accommodation may not be obvious. The EEOC has made it clear that the word “accommodation” simply means: doing things differently than are customary, and simply saying “no” does not constitute an interactive process. A conversation also helps where the employer may have questions about what type of accommodation might best help you apply for a job or perform the essential functions of a job. If you request, but cannot suggest, an appropriate accommodation, you and your employer should work together to identify one. There are also many public and private resources that can provide assistance without cost. Where more than one accommodation would work, your employer is allowed to choose the one that is less costly or that is easier to provide. Your employer may also ask you for additional documentation describing your disability and why the requested accommodation is needed, especially when your disability or need for accommodation are not obvious. The documentation required should be limited to a doctor’s note or other medical documents showing that you have a disability and need accommodation. Your employer should not require you to produce your entire medical or mental health history in order to receive accommodation for a specific disability. The EEOC has been clear that any employer may deny a request when providing an accommodation imposes undue hardship on its operations or finances. What constitutes and undue hardship is determined on a case-by-case basis. Applicants, as well as employees, are entitled to reasonable accommodation. If that were not the law, only those individuals who became disabled after they were already employed would be protected against disability discrimination. For example, an employer may be required to provide a sign language interpreter during a job interview for an applicant who is deaf or hearing impaired, unless to do so would impose an undue hardship. If you think you will need a reasonable accommodation in order to participate in the application process, you should inform the employer that an accommodation will be needed, so that the employer is aware of your need for accommodation and so you will be protected by the ADA if you are not accommodated in the application process. Yes, unless that modification would be an undue hardship for the employer. The requirement to provide reasonable accommodation covers all services, programs, and non-work facilities provided by the employer. If making an existing facility accessible would be an undue hardship, the employer must provide a comparable facility that will enable a person with a disability to enjoy benefits and privileges of employment similar to those enjoyed by other employees, unless to do so would be an undue hardship. For example, if an employee lounge is located in a place inaccessible to a person using a wheelchair, the employer might choose to modify or relocate the lounge, or if doing so is an undue hardship, then the employer might choose to provide comparable facilities in a location that would enable the individual to take a break with co-workers. No. An employer cannot make up the cost of providing a reasonable accommodation by lowering your salary or paying you less than other employees in similar positions. If the cost of providing the needed accommodation would be an undue hardship for your employer, however, you must be given the choice of providing the accommodation yourself or paying for the portion of the accommodation that causes the undue hardship. For more information, see question 12 above. The ADA also protects a person who is regarded (or treated) by an employer as if he or she has a substantially limiting impairment, even if he or she has no impairment or has only a minor impairment, particularly if the employer acts based on myths, fears, or stereotypes about a person’s medical condition. For example, an employer may not deny a job to someone who has a history of cancer because of a fear that the condition will recur and cause the employee to miss a lot of work. You are protected by the ADA if you are discriminated against because of your relationship or association with an individual with a known disability. The reason the ADA prohibits discrimination based on relationship or association is to protect you from job-related discrimination based on unfounded assumptions that your relationship to a person with a disability would affect your job performance, and from actions caused by bias or misinformation concerning certain disabilities. For example, if you have a disabled spouse and apply for a job, the ADA would prevent you from being denied employment because of an employer’s unfounded assumption that you would use excessive leave to care for your spouse. The ADA also would protect you if you do volunteer work for people with AIDS, and as a result had a discriminatory employment action taken against you that was motivated by that relationship or association. An employer is required to accommodate only known disabilities. Therefore, it generally is your responsibility as a disabled employee to inform your employer that an accommodation is needed. If you think you will need a reasonable accommodation in order to participate in the application process or to perform essential job functions, you should inform the employer that an accommodation will be needed, so that you are protected by the ADA if you are not accommodated. Your employer is under an obligation to keep information about your disability that you disclose confidential. The ADA requires that the results of all medical examinations must be kept confidential and maintained in separate medical files. The ADA allows an employer to refuse to hire individuals who pose a “direct threat” to the health or safety of themselves or others. A direct threat means a “significant risk of substantial harm.” Employers have legitimate concerns about maintaining a safe workplace for all employees and members of the public. In some instances, the nature of a particular person’s disability may cause an unacceptable risk of harm from the employer’s perspective. The determination that there is a direct threat must be based on objective evidence and reasonable medical judgment regarding an individual’s present ability to perform essential functions of a job. It cannot be based on unfounded fears or generalizations. An employer cannot refuse to hire you because of a slightly increased risk or because of fears that there might be a significant risk sometime in the future. The employer must also consider whether a risk can be eliminated or reduced to an acceptable level with a reasonable accommodation. The ADA requires that an employer provide employees with disabilities equal access to whatever health insurance coverage is offered to other employees. Your employer cannot deny you coverage that is made available to other employees or impose additional costs or restrictions on you because you are disabled. Depending on the level of coverage, however, the offered coverage may or may not fully cover the medical needs you have as a result of your disability. The ADA also does not affect clauses contained in health insurance policies about pre-existing condition even though such clauses may adversely affect employees with disabilities more than other employees. Alcoholism, and use of illicit drugs is not covered under the ADA. Anyone who is currently using drugs illegally is not protected by the ADA and may be denied employment or fired on the basis of such use. The ADA does not prevent employers from testing applicants or employees for current illegal drug use, nor from making employment decisions based on testing results that are verifiable. A test for the illegal use of drugs is not considered a medical examination under the ADA. Therefore, it is not a prohibited pre-employment medical examination and you will not have to show that the administration of the test is job-related and consistent with business necessity. The ADA does not encourage, authorize or prohibit drug tests. A worker who is an alcoholic is a person with a disability and is protected by the ADA if he or she is qualified to perform the essential functions of the job. However, the ADA still allows employers to discipline, discharge or deny employment to an alcoholic whose use of alcohol negatively affects job performance or conduct. An employer also may ban the use of alcohol in the workplace and can require that employees not be under the influence of alcohol, as long as that rule is uniformly applied. There may be times, however, when an employer must accommodate an employee with alcoholism. For example, an employer may have to modify a rule prohibiting personal phone calls at work for an employee with alcoholism who periodically has to contact his AA sponsor, if the employee has a need to do so during work hours. Yes. Some employees may need assistance in the event of an emergency evacuation because of medical conditions that are not visually apparent. Other employees may have obvious disabilities or medical conditions but may not need assistance. Employers, therefore, are allowed to ask employees to self-identify if they will require assistance because of a disability or medical condition. After making a job offer, but before employment begins, an employer may ask all individuals whether they will need assistance during an emergency. An employer also may periodically survey all of its current employees to determine whether they will require assistance in an emergency, as long as the employer makes it clear that self-identification is voluntary and explains the purpose for requesting the information. Finally, whether an employer periodically surveys all employees or not, it may ask employees with known disabilities if they will require assistance in the event of an emergency. An employer should not assume, however, that everyone with an obvious disability will need assistance during an evacuation. For example, many individuals who are blind may prefer to walk down stairs unassisted. People with disabilities are generally in the best position to assess their particular needs. An employer should inform all individuals who are asked about their need for emergency assistance that the information they provide will be kept confidential and shared only with those individuals who have responsibilities under the company’s emergency evacuation plan. For further information, see Obtaining and Using Employee Medical Information as Part of Emergency Evacuation Procedures. The ADA makes it illegal for a private employer to discriminate against a qualified individual with a disability only on the basis of disability. Therefore, an employer is free to select the most qualified applicant available and to make employment decisions based on reasons unrelated to the existence or consequence of a disability. For example, if two people apply for a typist position, one is a person with a disability who accurately types 50 words per minute, the other a person without a disability who accurately types 75 words per minute, the employer may hire the applicant with the higher typing speed, if typing speed is needed for successful performance of the job. An employer can establish attendance and leave policies that are uniformly applied to all employees, regardless of disability, but may not refuse leave needed by an employee with a disability if other employees get such leave. An employer also may be required to make adjustments in leave policy as a reasonable accommodation for a worker with a disability. The employer is not obligated to provide additional paid leave, but accommodations may include leave flexibility and unpaid leave. A uniformly applied leave policy does not violate the ADA because it has a more severe effect on an individual because of his or her disability. However, if an individual with a disability requests a modification of such a policy as a reasonable accommodation, an employer may be required to provide it, unless it would impose an undue hardship. For more information, see our page on disability leave. A disabled employee may also be eligible for leave under the Family & Medical Leave Act. For more information, see our page on family/medical leave. Consider undue hardship. Depending on the duration and frequency of the leave, and the impact on the employer’s business, a leave of absence might be an undue hardship that an employer need not offer. An open-ended, indefinite leave is always an undue hardship; other types of leave should be evaluated for undue hardship on a case-by-case basis. 27. What are my rights after becoming disabled or injured on the job? Work-related injuries must be evaluated on a case-by-case basis to determine if a worker is protected by the ADA. Only injured workers who meet the ADA’s definition of an “individual with a disability” will be considered disabled under the law, regardless of whether they satisfy criteria for receiving benefits under workers’ compensation or other disability laws. An employee also must continue to be “qualified” (with or without reasonable accommodation) to be protected by the ADA. Work-related injuries do not always cause physical or mental impairments severe enough to “substantially limit” a major life activity. Also, many on-the-job injuries cause temporary impairments that heal within a short period of time with little or no long-term or permanent impact. Therefore, many injured workers who qualify for benefits under workers’ compensation or other disability benefits laws may not be protected by the ADA. An employer may not inquire into an applicant’s workers’ compensation history before making a conditional offer of employment. After making a conditional job offer, an employer may inquire about a person’s workers’ compensation history if a medical inquiry or examination is required of all applicants in the same job category. However, even after a conditional offer has been made, an employer cannot require a potential employee to have a medical examination because a response to a medical inquiry (as opposed to results from a medical examination) shows a previous on-the-job injury unless all applicants in the same job category are required to have an examination. Also, an employer may not base an employment decision on the speculation that an applicant may cause increased workers’ compensation costs in the future. However, an employer may refuse to hire, or may discharge an individual who is not currently able to perform a job without posing a significant risk of substantial harm to the health or safety of the individual or others, if the risk cannot be eliminated or reduced by reasonable accommodation. An employer may also refuse to hire, or may fire, a person who knowingly provides a false answer to a legal inquiry about his or her condition or worker’s compensation history made after the offer of employment. It does not violate ADA confidentiality requirements for an employer to submit medical information and records concerning employees and applicants (obtained after a conditional job offer) to state workers’ compensation offices and “second injury” funds. The Equal Employment Opportunity Commission (EEOC) is the agency of the federal government responsible for investigating charges of job discrimination related to disability discrimination in workplaces of 15 or more employees. Most states have their own agencies that enforce state laws against discrimination (see below). Your state law may allow for greater or different remedies than federal law (see question 29 below). 31. How can I file a disability discrimination complaint? 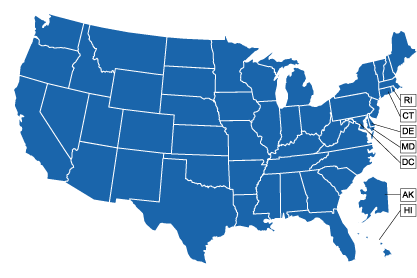 For more information on filing a complaint for disability discrimination, select your state from the map below or from this list.